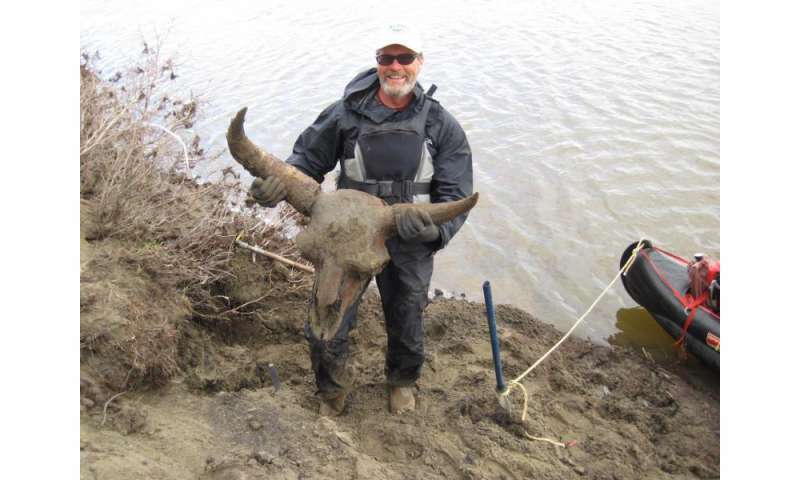 University of Alaska Fairbanks researcher Daniel Mann holds a steppe bison skull from the last ice age that he and fellow UAF researcher Pamela Groves found together with the rest of its well-preserved skeleton. Although the Arctic's frozen ground preserves bones remains exceptionally well, said Mann, it's rare to find such a complete skeleton. The bison, which the researchers nicknamed "Bison Bob," dated to 40,000 years ago and still had some fur on it. Credit: Photo by Pamela Groves for the Bureau of Land Management. 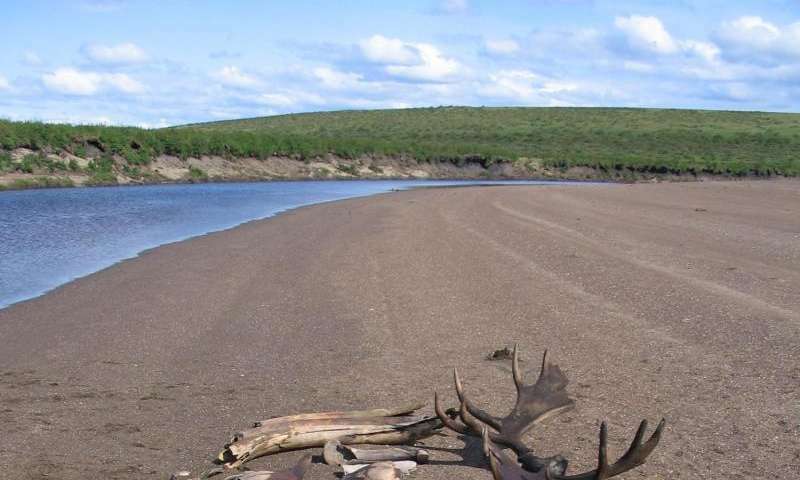 University of Alaska Fairbanks researchers Daniel Mann and Pamela Groves found these ice age antlers, tusks and bones in a single day of collecting along an arctic river. The moose antlers date to 12,000 years ago. The picture also shows steppe bison bones, several mammoth tusks and bones, a muskox skull and several horse leg bones. Credit: Photo by Pamela Groves, University of Alaska Fairbanks. During the last ice age, lowered sea level drained the Bering Strait, the narrow seaway now separating Alaska and Asia. Being able to move back and forth across Bering Strait is probably what kept the large Arctic mammals thriving for so long, Mann said. This travel corridor allowed mammals to come to Alaska when their favored foods—grasses, sedges, and rushes—thrived during warm periods. 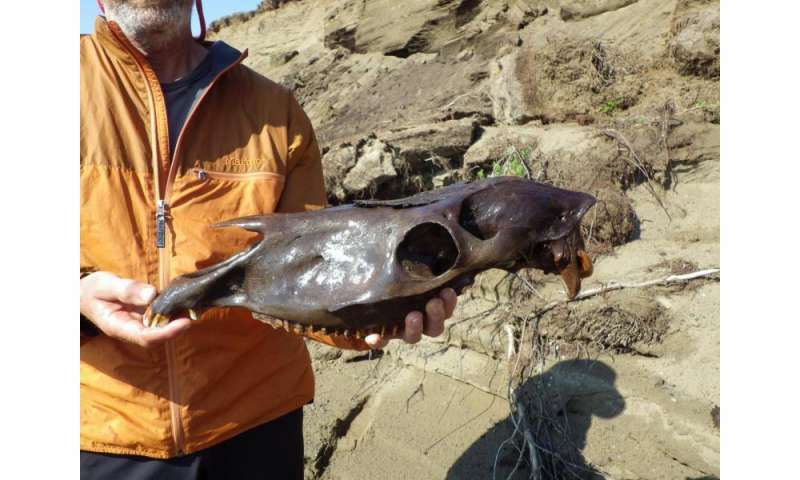 Daniel Mann, associate professor of Geosciences at the University of Alaska Fairbanks, holds the upper part of a skull belonging to a young stallion that roamed the North Slope about 22,000 years ago during the last ice age. Mann found the skull eroding from a river bluff. Interestingly, most ice-age horse skulls found on the North Slope belong to young stallions. Credit: Pamela Groves, University of Alaska Fairbanks.